In June 2017, the Government of Canada announced as part of its widely awaited new Defence Policy that it will grow defence spending over the next 10 years from $18.9 billion in 2016-17 to $32.7 billion in 2026-27. Following this welcome announcement, a flurry of headlines emerged related to improved capabilities and to significant investments in new equipment, such as various types of ships and aircraft. Less frequently reported aspects of the new Defence Policy are focused on the environment rather than acquisition of new equipment. For example, a $225 million commitment has been made to reduce Defence carbon footprint, and there is now a requirement that all new construction and major Defence projects attain Silver Leadership in Energy and Environmental Design (LEED) standard or equivalent. (LEED green buildings must comply with environmental regulations and make efficient use of resources such as energy and water). In addition, the new Defence Policy commits to making investments to enhance Canada’s capability and ability to operate in the Arctic in order to project force into the region. Even though military operations are not typically associated with environmental protection and stewardship, Canada’s Department of National Defence is committed to evolving as an environmentally responsible and sustainable organization. The Defence Environmental Strategy presents a plan for ensuring sustainable military operations. The plan includes commitments to manage and treat all wastewater from defence establishments before discharge to the environment, manage all hazardous materials and substances through to disposal, and develop a culture that is more conscious of water use to ensure access to a continuous supply of safe water while using as little water as possible. There are disparate aspects in both the new Defence Policy and the Canadian Defence Environmental Strategy that are related to wastewater treatment. Most civilians never give a second thought to something as mundane as wastewater treatment and rely on municipal services or simple septic systems. However, these wastewater treatment options are generally not available for military activities, which poses real challenges. The operation of naval vessels inevitably generates various types of wastewater such as used oils, oily bilgewater, blackwater, greywater, ballast water and more. Increasingly the management of these wastewaters is coming under scrutiny. Many of these streams must be treated on the ship and discharged according to various standards to protect ocean and inland waters; failing this, the streams must be retained onboard, which can be challenging depending on the voyage and the storage capacity of the ship. The discharge of oil in any form is toxic to marine life and remains in the marine environment for years. Effects on marine species can include disease as well as negative impacts on development and reproduction cycles. Generally, oily bilgewater must be treated by a Type Approved oily water separator (OWS) equipped with a Type Approved oil content monitor (OCM). Treated bilgewater that is discharged to ocean water is typically required to have 15 ppm oil or less; inland waters require 5 ppm or less. The discharge of streams such as blackwater and greywater is also problematic, since they contain high levels of nutrients such as phosphates and nitrates. For mariners, blackwater generally refers to sewage and there is no requirement in most cases for treatment of greywater prior to discharge despite its high nutrient content. However, some vessels do choose to treat both blackwater and greywater even if it is not mandated. The excessive release of nutrients into bodies of water can lead to eutrophication, characterized by an explosive growth of algae (algal bloom), which subsequently depletes the water of oxygen leading to devastating effects on marine species. A high proportion of inland and coastal waters in North America are affected to some extent by eutrophication due to nutrients coming from various sources, many of which are more important than ship discharges. A variety of marine sewage treatment plants are available for ships, but the design and operation of these is challenging due to various factors, including high strength of wastewater, intermittent and variable production of wastewater, ship motions, and inclusion of various cleaning products and fluids which are not well tolerated by biological systems. Unlike OWSs, there is no requirement to monitor the effectiveness of the sewage treatment prior to discharge. In order to minimize pollution of the oceans, the International Maritime Organization (IMO) developed MARPOL 73/78, which is the most important international marine environmental convention. Close to 100 per cent of the world’s shipping tonnage are state parties to the convention, which includes Annexes I-VI that regulate different forms of pollution. Ships that are flagged under countries that are signatories to MARPOL (including Canada) are subject to its requirements wherever they operate. Although MARPOL does not apply to defence vessels or other ships used by government for non-commercial activities, there are widespread efforts to respect the regulations through the use of appropriate equipment and practices whenever possible. In some areas of the ocean, the potential for environmental damage due to oceanographical and ecological factors, and/or intensity of traffic is so great that designation as a “Special Area” subject to special regulations is required. For example, any discharge of oil or oily mixtures is prohibited in Antarctica. Recently, due to global warming melting sea ice across the Arctic, shipping routes once thought impossible are opening up, leading to rapidly growing international interest and traffic in this area. As a result of this, and after years of consultations and effort, IMO adopted the Polar Code (International Code for Ships Operating in Polar Waters). 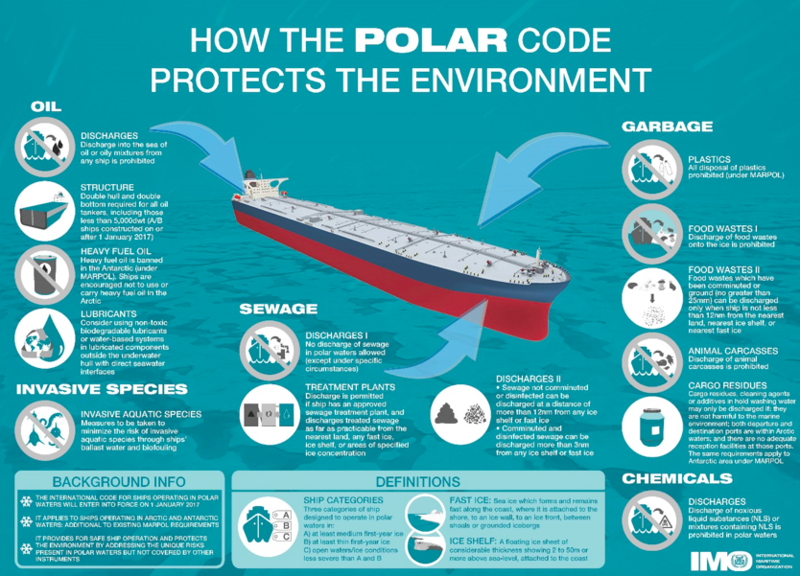 The Polar Code entered into force on January 1, 2017. Discharges of oil or oily water are prohibited, sewage (blackwater) may be discharged under specified conditions, and greywater is not regulated. Nations, and even selected jurisdictions within nations, can enact their own marine protection legislation separately from MARPOL requirements, even if they are a signatory to the convention. For example, Alaska has imposed discharge standards for grey water from cruise ships carrying 500 or more passengers. Like ship crew, military personnel in defence buildings and bases generate blackwater and greywater; other streams contaminated with oil, solvents, chemicals or hazardous agents may also be generated. Depending on location, there may be no possibility of discharging to a municipal sewage treatment plant, and in some cases, due to its nature, the wastewater cannot be accepted by a municipal facility even if there is one present. Defence buildings can minimize the volume of sewage generated, reduce per capita water consumption, and at the same time earn points towards attaining Silver LEED status by treating and reusing greywater onsite. In addition to their primary role as the protectors of Canada, Canadian Forces are involved in other activities where wastewater challenges are real and present since municipal treatment systems are simply not available. These include defending Canada’s vast Arctic region, and participating in humanitarian efforts, disaster relief, peace-keeping and expeditionary operations. Wastewater produced in these activities is often highly concentrated since there is low per capita water consumption, and it may contain high levels of infectious agents. Inadequate wastewater management can endanger the health and safety of military personnel and civilians, in addition to potential negative environmental impacts; reliance on external contractors to truck-haul wastewater may represent a security risk. Standard approaches for wastewater treatment are not always easily transferrable to military operations for a variety of reasons. Sewers to collect sewage are not possible in the Arctic due to permafrost. Septic systems are not practical for temporary military operations, and lagoons are not possible for frozen lands. Biological treatment, one of the mainstays of conventional wastewater treatment, is not practical in cold climates, or when the flow of wastewater is intermittent. Biological treatment systems often take 1-2 weeks to become fully operational, which is not acceptable for many situations encountered by military personnel. It is clear that solutions designed specifically for the requirements of marine or land-based defence activities are required, so that military personnel can focus on their missions rather than concern themselves with the operation of pollution control equipment. Systems need to be deployable, dependable, robust and transportable. They need to have rapid start-up, on/off capability, automatic operation, and have the possibility of remote monitoring. In addition to the equipment that carries out the treatment, new approaches for the management of various wastewater streams needs to be considered in order to facilitate meeting defence and regulatory environmental targets. Recently, Terragon Environmental Technologies Inc. and Alion Science and Technology, along with commercial and government partners, carried out a paper study aimed at developing a Zero Waste ship. In the scenario envisaged, solid waste (garbage and sludges from ship operations and wastewater treatment) were processed in MAGS, a small-scale gasifier developed by Terragon and Type Approved for marine operation. MAGS generates energy for use by the ship and has been installed on numerous vessels, including the first cruise ship to voyage through the Northwest Passage. Next, the scenario made use of Terragon’s Type Approved WETT-O for treatment of oily bilgewater, and oily sludge generated from this process was sent to MAGS. Terragon’s WETT-G was used to treat ship greywater for reuse onboard the ship, thus significantly reducing overboard discharge and potable water requirements. Terragon’s WETT-S was used to treat ship blackwater. The Zero Waste ship concept was evaluated for three types of ships: a tanker, an offshore supply vessel (OSV), and a frigate. Capital and operating costs were assessed and based on an annual cost of ownership. Over a 25-year period, savings of 64 per cent, 13 per cent and 29 per cent were estimated for the tanker, the OSV and the frigate respectively. It is clear that novel robust wastewater treatment and water reuse approaches specifically designed for the unique challenges and realities of the military will be required to support Defence sustainability objectives in the future. Camp Sustain is a new Canadian Defence project aimed at delivering new camp utilities to improve energy efficiencies and reduce the environmental footprint in operational environments. The project targets include reducing water demand by 50-75 per cent and liquid waste by 50-75 per cent through use of deployable water treatment plants, with final delivery planned for 2025. Terragon is an award-winning cleantech company based in Montreal and founded in 2004. Terragon is developing proprietary wastewater solutions for defence and other applications based on electrochemical technologies. Terragon has received support for its wastewater research and development activities from various organizations including the Department of National Defence through Defence Research and Development Canada (DRDC), the U.S. Office of Naval Research (US ONR), Sustainable Development Technology Canada (SDTC), and the U.S. Army. Dr. Poirier is a Chemical Engineer with 30 years of experience in technology development, R&D management and consulting. She has led the development of technologies in materials processing and environmental protection. 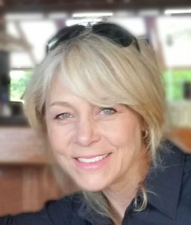 As the WETT Program Leader for Terragon Environmental Technologies Inc., located in Montreal, Canada, she has led the development of award-winning electrochemical approaches for the treatment of blackwater, greywater and bilgewater. These approaches allow the reuse or safe discharge of wastewater in ships, contingency operations, and isolated habitats. Dr. Poirier obtained her Engineering degree at the University of Ottawa, and her Master’s and Ph.D. degrees at McGill University.